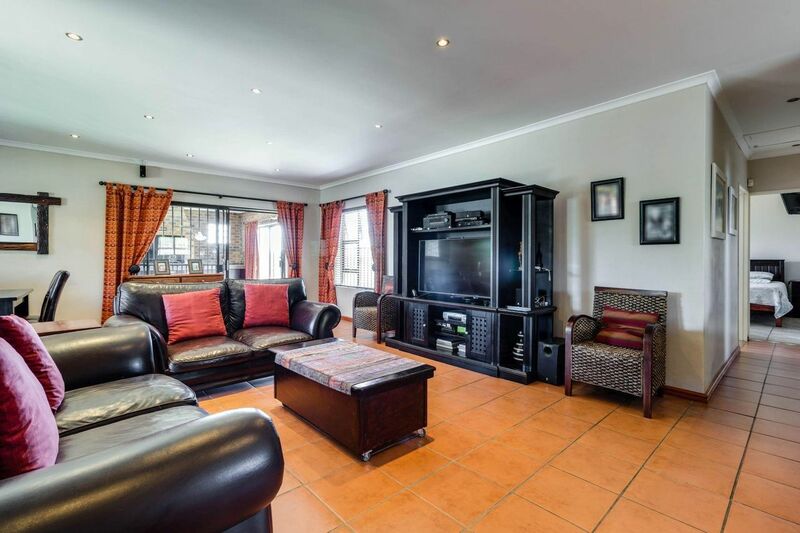 Sign up and receive Property Email Alerts of Houses for sale in Protea Heights, Brackenfell. Cruise into the quiet cul de sac and await the automated gate to carefully unveil the four bedroom beauty! This lovely home opens to stunning open plan dining, TV/Family area and kitchen. The kitchen has plenty of cupboard space and also have a scullery with a dishwasher point. The braai room has strikingly modern cupboards complimenting the built in braai for those who love to entertain. As you walk down the passage, you will reach the three bedrooms with built in cupboards and a full bathroom. The excitement builds up as you reach the main bedroom that boasts with a rather huge en-suite full bathroom. The fourth room is reached by using the side entrance and has its own en-suite bathroom. Perfect for an extra rental income or a bachelors pad. This room can easily reconverted with the bedroom door opening up in the same passage as the other three bedrooms. The property further features two 5000 liter tanks, electric fencing and a gated side entrance to the bachelors pad for a smaller vehicle or trailer. Its privately located away from all the noise and buzz of traffic, but still close to nearby daycare, schools and amenities. Popular schools in the area is Bastion Primary, Curro Brackenfell, Curro Castle, Protea Heights Academy etc. Sign-up and receive Property Email Alerts of Houses for sale in Protea Heights, Brackenfell.